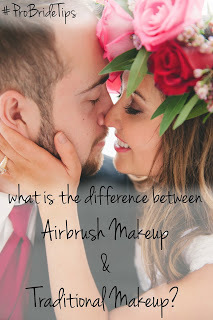 WHAT IS THE DIFFERENCE BETWEEN AIRBRUSH MAKEUP & TRADITIONAL MAKEUP? I offer two kinds of makeup applications. This is traditional (also known as regular) makeup, and airbrush makeup. Almost every bride I talk to asks what the difference is, so I am answering it here! How It Works: a small amount of liquid makeup is placed in a chamber by the makeup artist. After turning on an airbrush compressor the artist pulls back a trigger on her airbrush gun and the makeup comes out in an even, light and fine mist. I recommend this for people with acne and other skin problems. It always has a flawless finish and sets on the skin beautifully. I really recommend it for all brides because it will last all day and looks flawless on camera and in pictures. It is also sweat, water and tear resistant and does not transfer onto clothing. How It Works: makeup is placed on a brush or sponge and spread around and then blended into the skin. Usually it is a liquid makeup, but it can be a powder or mousse makeup as well. This is the kind of makeup that is applied traditionally and is usually what women use at home on themselves, although I use high ends brands such as RCMA and Temptu on my clients that can not be found in drugstores and that most people do not have at home. I really only recommend this type of makeup for brides who have clear skin. Below are both examples of brides who have traditional makeup on. The one on the left (in color) has really clear skin, with only a few minor blemishes. The one on the right (in black and white) however, has several blemishes. You can see that in the pictures below that even after editing, the bride on the right's makeup looks heavier and you can still see the blemishes on her chin. In the end the only time I recommend a bride not get airbrush makeup is if they have very clear skin and want to save some money. A lot of Brides also opt for the traditional foundation for engagement photos, and they leave the airbrush for the bridals and wedding day. I have also had brides choose traditional foundation if they are not used to wearing any makeup whatsoever. While the airbrush foundation looks light and flawless in photos, a lot of brides who never wear any kind of foundation feel it is to heavy in person. Regardless of how you look on camera I want you to FEEL beautiful and confident on your wedding day, so if the airbrush feels to heavy on you, we should switch to traditional. If you regularly wear foundation, you will not feel the airbrush is to heavy as you are used to having foundation on. However if you struggle with acne, scarring or any kind of skin inconsistencies, airbrush is a better option to cover it. If you are one of the people who struggle with acne, scarring, or other skin issues, and you also do not wear any makeup, then booking a trial would be ideal. If you are worried about making the right choice for you, then I also recommend booking a trial. It will make your big day go a lot smoother. While airbrush may appear heavier in person (which it doesn't to a lot of people), it looks very natural and light on the skin in photos, and those are what you will keep forever.